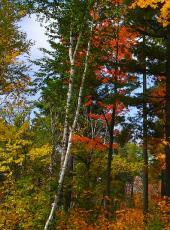 We held our annual Scout-o-rama today - another perfect day with sun and rustling leaves. One of these days, we're going to get wiped out by a huge storm - all our outings this year have fallen on wonderful weather. It's just a matter of time and averages. We had a new twist to the scout-o-rama this year. It was planned by a single patrol as a regular outing rather than by the troop at large and we invited the other four troops in town. Two said they would participate and one actually did. They did an excellent job running a CPR station and Emergency Carries. There were 10 skill stations all together and 25 Webelos, just as in past years. Our goal is to ultimately make this day a community event where boys that are in 5th grade but have not been in Cubs get a chance to check out Boy Scouts along with the Webelos. It has a way to go, but having the other troops involved is the first step. Next year, we'll start the planning earlier so all the troops have ample time to join in if they want. 2.5 years ago, I blogged about the silliest ScoutStuff products which included wooden forks, knives, and spoons. Evidently, I wasn't the only one that thought they were silly and they are now cut in price to only 17 cents a set! For $2.00, you can get 12 forks, knives, and spoons. That's 68 cents per scout for a weekend of four meals. Now, I still think it's silly, but they do make a fun prize for patrol competitions and that sort of thing. (I've actually used them for that and the scouts got a kick out of it.) How about you help out the ol' BSA and pick up a case or two of these things so ScoutStuff can make room for more fleur-de-lis cookie cutters or grandpa's fireforks. Followed eight scouts on a 5-mile hike yesterday around the town. Each one successfully oriented their map, showed our direction 3 times, and led the gang for over a half mile with at least 3 intersections and changes in direction. We've got miles and miles of sidewalks, paved trail, and unpaved trail throughout our town and we used them all. We even had a short stretch along a road with no trail, so we use our hiking safety skills. We also found some big, beautiful, red poison ivy as well as many other plants ranging from wild grape vines to red pine to still gree buckthorn. No one quite identified 10 plants, but some got close. Animals were more scarce with just a squirrel, Canadian goose, blue jay, and red-wing blackbird being identified. We did see a flock of white pelicans floating high in the bright, clear blue sky but none of the scouts could identify what they were. As the sun began to set, a couple scouts were getting concerned we wouldn't make it back in time since they hadn't brought flashlights, but they did a great job and we were only 4 minutes late on a 2 hour estimate. If you're in the NorthEast, batton down the hatches. The rest of you guys, get your scouts out to enjoy this great hiking time of year. It's Fall! For the next few weeks, we've got perfect camping and scouting weather - at least up north here. In a couple weeks, we can have snow and that can really limit the opportunity for advancement for T-2-1 rank requirements. 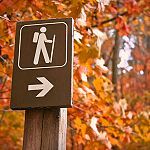 Now is a perfect time for those 5-mile hikes and 1-mile orienteering activities - no bugs, cool weather, and beautiful colors. Well, no bugs here except those crazy boxelder bugs and an occasional suicidal mosquito. Yesterday, I had four Tenderfoot scouts lead me around our town on a 5-mile hike. It was spectacular! We saw geese, a squished frog, squirrel, crows, birch, poplar, red oak, white oak, and other plants and animals. In a month, it will be a lot more difficult to identify those plants without their leafs and the animals will be less plentiful. Try to get your scouts out for those few nature requirements now. The first aid, memorization, and 'explain' requirements can more easily be done indoors in the winter. This is a Sponsored Post written by me on behalf of WD-40. All opinions are 100% mine. There are a few tools and items in every great Scoutmaster's garage. You've probably got a handful of tent stakes, two half-full bottles of camp suds, and at least one can of WD-40. Does anyone really even know what WD-40 is made from? I guess it doesn't really matter much as long as it works. :-) The point is that you have it handy because Scoutmasters are constantly called on to fix this, mend that, and make do. Projects are always popping up and scouts rely on you to help them learn to handle problems themselves. Since scouting gear is out in the elements so much, protecting from rust and getting rid of corrosion are two things that come up occasionally and WD-40 fits the bill. "How do you inspire others to be leaders and problem solve problems?" You can read the contest rules but the prize is about $50 worth of WD-40 items, including a "Now & Then Pack", baseball cap, and stainless steel travel mug. One of the things I use WD-40 for is fishing.� Spray a bit on the lure and for some reason it often increases the hits. Watch the latest WD-40 video release and you'll see why I got a good laugh. Another use that you may not know of, but could be quite useful for Scouters - WD-40 can take off the sticky residue from using Badge Magic! Now, THAT's a good use.� Protect anything metal from rust and corrosion, lubricate moving parts, dissolve gunk, even catch fish. Wd-40 is the can with 1000 uses - what's your use? So, here's a trick question: What rank is required to attend Philmont, Northern Tier, or Sea Base? You can find many troop websites listing a minimum rank requirement of First Class. You can even find council requirements listing First Class as a requirement. But, those are not BSA high adventure base requirements. They've been set up by that particular unit or council to help ensure the scouting skills of participants. There actually is no rank requirement at all for any of the national high adventure bases. A 17.5 year old Boy Scout that has yet to earn Tenderfoot can be on your crew! Would I recommend that? not normally, but if you have a boy experienced in the outdoors join your troop in 10th grade to do exciting camping with his buddies, you don't need to force him through months of sign-offs and three boards of review before doing the high adventures. Sea Base - Participants must be thirteen (13) and graduated from the 8th grade or fourteen (14) years old to participate in all programs. Northern Tier - Youth participants must have attained the age of 13 by the year that they attend. Philmont - Philmont participants must be 14 years of age OR completed 8th Grade and be at least 13 years of age prior to participation. Whre does all that popcorn come from that scouts sell? Well, don't try finding it at any of these places - you'll most likely get lost in your efforts. There are corn mazes across the country this month and many of them have been designed with Boy Scout themes to commemorate the centennial. An exciting time for Scouting here in Minnesota. The Base Camp open house happens tomorrow (Oct. 2). If you're in the area, or traveling through soon, you really should check it out. A space flight simulator - I didn't get to see this. It's just tugged into a corner room, compared to the vastness of the whole place. The indoor ampitheater is a cool, sunken seating area where there will probably be a propane fire or something similar. It even has a flag pole to the audience's left for scouts to use for ceremonies. The ropes course will be a real challenge for anyone. I mean the indoor ropes course, but there is also a massive outdoor double tower and high ropes cours! My favorite part - by far - is the climbing facility. In the photo you can only see the front view. 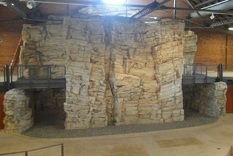 But, there are climbing surfaces completely surrounding the structure and on the back wall behind it. This climbing facility is just too cool for words - you've really got to see it to understand what I mean. There are manual and auto-belays as well as a great bouldering wall and the equipment is stored in a hidden area under the mountain. The climbing surface is so realistic, you have to touch it. I bet most people that come to climb will say - "Where's the handholds?" - expecting a climbing wall with screwed in holds. This wall is a completely natural textured cliff with handholds whereever you can find purchase. Even the floor will surprise you - it looks just like pea gravel, but when you walk on it you notice it is shredded, colored rubber. The coolest thing about the climbing is right outside. Walk just south of the building and look at the rock beside the road - it is exactly like the artificial rockface inside! They've done a super job of making the wall match what you would climb if you were on the rive bluff faces. If you've followed my blogging much, you've read me criticize some BSA things. I'm usually concerned with how our money gets spent. This Base Camp facility has been a big expense, but it appears to me to be a great investment for the future of scouting in the Northern Star Council. With our bitter cold winters, an indoor facility to practice scouting skills year-round has huge potential. If you are not based in the area, but your troop makes plans to visit Northern Tier for canoeing, you should consider stopping at Base Camp. It is right at the MSP international airport so you might be able to do a lay-over night right here on your way 'Up North'. Check out more at the official Base Camp site. To help scouts keep track of the various requirements of miles, nights, hours, and adventures for the National Outdoor Badge awards, I've created some documents. Hopefully, they'll make the broad range of requirements more manageable for your scouts. 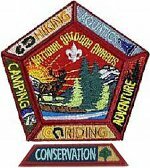 See the National Outdoor Badges page for the PDF files. There's not a hunting merit badge yet, but that doesn't mean scouts can't excel at hunting skills. 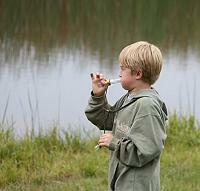 A Webelos scout is the winner of the inaugural duck calling contest at Whittlesey Creek National Wildlife Refuge, WI. He completed a 3-day waterfowl course at the refuge and then entered the calling competition. The course is for 10-15 year old hunter-certified youth to learn waterfowl identification by sight and sound, silhouette, wing beats, flock patterns and behavior. The contest included these calls: long-distance call, mating call, feeding call and comeback call. The emphasis is on difficulty, accuracy and repetition. Somebody at BSA learned Flash programming this summer. The new bsauniforms.org site takes you on a fun-filled, whirlwind tour of uniforming from Tiger Cub through Scout Leader. Hold onto your hats and watch your little scout spin in circles and walk across your screen. Wow! Cute, but I don't see the value in weird music, spinning, stumbling scouts, and dragging patches to shirts. 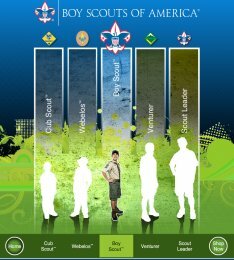 The best part of this extravagant, interactive experience is the link to Documents on scoutstuff.org which has the useful, printable patch placement sheets with pictures AND text. After every driving trip the troop takes 'out west', I swear to myself that's the LAST time we stop at Wall, South Dakota! But, when it comes round to planning the next long-distance trek Wall Drug always gets listed as a place the scouts decide to stop. You've got to admit, there are some places across the country that just are America, good, bad, or just silly. From the world's largest ball of twine to the world's largest potato, from the first McDonald's to the first baseball diamond, when you're traveling through, how can you skip them? probably just about the time when the next trip gets planned.